A big thanks to Daryl Anderson, of Clark Creative Group, for designing the new company logo for American Arborist. Daryl does some phenomenal work! A big thanks also to Roxzanne Abbott for helping to facilitate the process. If you need any creative type work done, these are the people to talk to. Ideas, action, results. That is their motto and they deliver! American Arborist: Now even greener! 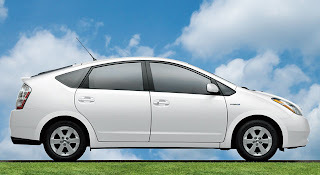 The newest car in the American Arborist Fleet is a Toyota Prius Hybrid. The car has proven very efficient driving around Omaha. In the last month it has been averaging around 46 mpg! Another way is to call us! American Arborist can handle all of your hedge sculpting and trimming. My parents live on an acreage with lots of young trees that they planted. This year the deer have really gone after the trees by marking their territory. This ritual act can severely damage or kill your young tree. They came to me asking what can be done to protect them. Here are two common methods to keep them away. #1 Physical barrier. Some fence posts and chicken wire is definately the most fool proof method to protect your tree. #2 Irish Spring Soap. Wire around all of the trees is expensive and unsightly. Irish Spring soap hung from the tree in a stocking or by rope is sure to keep the deer away. They mark their territory by scraping the bark and by urinating on the tree. If the tree smells so strongly of something else, they will leave it alone. I hope this helps any of you that have had deer problems. My new bow is in the mail. Hopefully that will help with some of the deer at my parents as well! Did your pin oak's leaves look like this? You probably have an iron deficiancy in your soil. 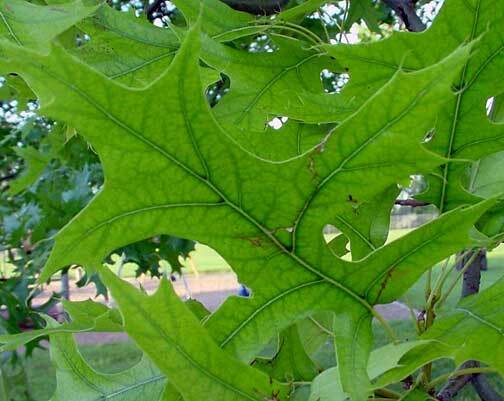 Most pin oak (red oak) trees in the metro area do not get enough iron and have chlorosis. You can identify a tree with the disease by yellowish/light green leaves that may have some spots on them. It is a simple problem but if untreated can lead to an unhealthy tree or a dead tree. Contact us about an easy iron injection to get your tree healthy again. Does your tree look like this? 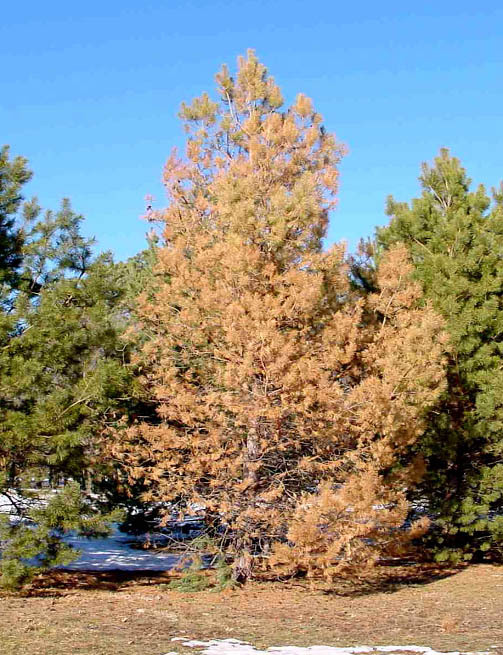 Many pines in the central U.S. have been affected by pine wilt. 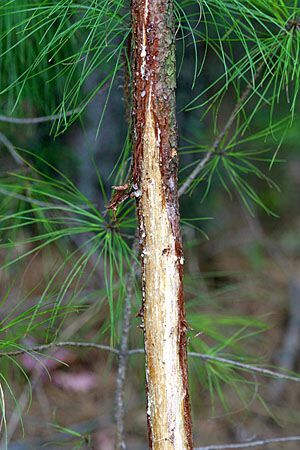 Pine wilt is spread by pine sawyer beetles from tree to tree. The beetles carry a small parasite and transfer the it when they feed on the tree. The only way to destroy the beetle is to burn or chip the tree. If your pine is starting to wilt, chances are it has pine wilt and IT NEEDS TO BE REMOVED!!! Even if it still has green on it, it is an infected tree. This infected tree will spread to other trees around. The inaction of removal will in fact cost much more. For more information on pine wilt refer to this University of Nebraska page. For those of you with a very healthy pine that you do not want to lose, there is help. Do not pay to have your tree sprayed. There is no chemical spray that will save your pine. There is however an injection that has been proven to work here in Nebraska. Please ask us to evaluate your pine tree for treatments. American Arborist is a vision of Dan Sundermeier. I offer tree services at a reasonable price. I have been working with trees for 5 years. 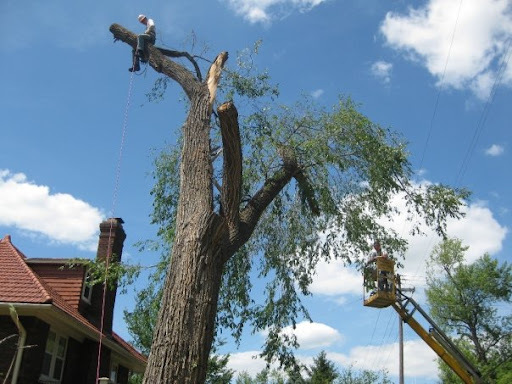 On this blog style webpage, you will find up to date relevant information on tree diseases and updates on recent tree jobs.